Understanding Salvation: Faith or Works? If you die while committing a sin, do you go to Heaven or Hell? Do people who commit suicide lose their salvation? Will God reject me if I think a sinful thought? Concerning salvation, those are a few questions that commonly arise. But rather than answer those questions directly, it’s best to address the flawed paradigm out of which those sorts of questions can emerge. However, when seeking to address a question at its foundation, I am often accused of “word play” or “dodging the question”. But I assure you that in no way is addressing a question’s hidden assumptions “dodging”. Let me give you an example. Let’s say that I ask you, “Have you stopped stealing from your friend?” Let’s also say that when you, appalled at the accusation, try to dismiss the overall assumption, I interrupt you with a firm reiteration: “Just answer the question! Have you stopped stealing from your friend? Yes or no?” The problem is that if you say, “yes”, you are admitting to the false accusation of stealing from your friend. If you say, “No”, you are admitting that you are presently stealing from your friend. So what is the hidden assumption behind the question, “Have you stopped stealing from your friend?” The hidden assumption is that you steal from your friend at all. So when someone insists on you answering their question within the limitations they have constructed, look for the hidden assumption behind the question itself. Never let anyone limit your answer. If they ask you a question, you have every right to answer their question however you so choose. A question in response to a question is a legitimate response. Now let’s revisit the questions from the beginning of this post. All of those questions are built on the assumption of a “Works-based” mentality of salvation. Each question assumes that our actions are what save us. In the book of Romans, Paul the Apostle lays out a clear presentation of man’s state, the power of the gospel and the way to eternal life. In verse after verse, Paul the Apostle tells us that, in order to receive the free gift of salvation, all we must do is believe and receive it in faith. This letter to the Romans seems to be problematic when one weighs the ideas of “not by works” with “you must have faith”. This seems to be a contradiction. However, the illusion of a contradiction disappears when understanding is found. While some over complicate Paul’s writings with highly imaginative interpretations, forced reads and wild speculation, there is a very simple truth that calms the chaos. Here is that simple truth: To God, though faith is an act of the will, it is not considered a work. Keep in mind also that Paul makes reference to both the OT laws and the moral laws – so that both Jews and Gentiles are without excuse. Adherence to neither of these laws can save a man. If we define works as God defines works, we find harmony in the scripture. Based upon the scripture’s definition of works, we find that not all conditions can be considered to be works. Faith is not a work, but it is an act of the will. So do our works contribute to our salvation or not? I have thought of two analogies that will help you to understand salvation and rid you of unbiblical assumptions on this specific topic. I want you to picture a tree. See its leaves, branches and stems. Imagine its thick trunk and twisted roots. Allow yourself to see through the dirt and visualize the tree in its entirety, from the highest point to the far tip of its deepest root. Now, let us say that this tree represents your salvation. Only a real tree can bear fruit. But is it the fruit that causes the tree to grow? No, it is the root system that causes it to grow. Good works are the fruit of salvation. They are not the root of salvation. The root of salvation is repentance and humility. Then God takes over from there. We must keep in mind that there is a very real supernatural element to our salvation. We, in humility, repent and turn toward God. He then responds to our repentance with the miracle of transformation. Though we cannot bring about salvation, God can. And He does so based upon how we respond to His truth. So salvation is God’s doing based upon man’s response to truth. If a man repents, God will save him. But salvation itself is not man’s doing. And, you know, the salvation part is really the important part. So the tree is salvation. The roots are repentance and humility. Then God transforms us. From there, our salvation, if genuine, will produce the fruit of good works. Many have it reversed in their mind. They think that if we act a certain way, those actions will bring about transformation. But that is not the case. Only God can transform a heart. 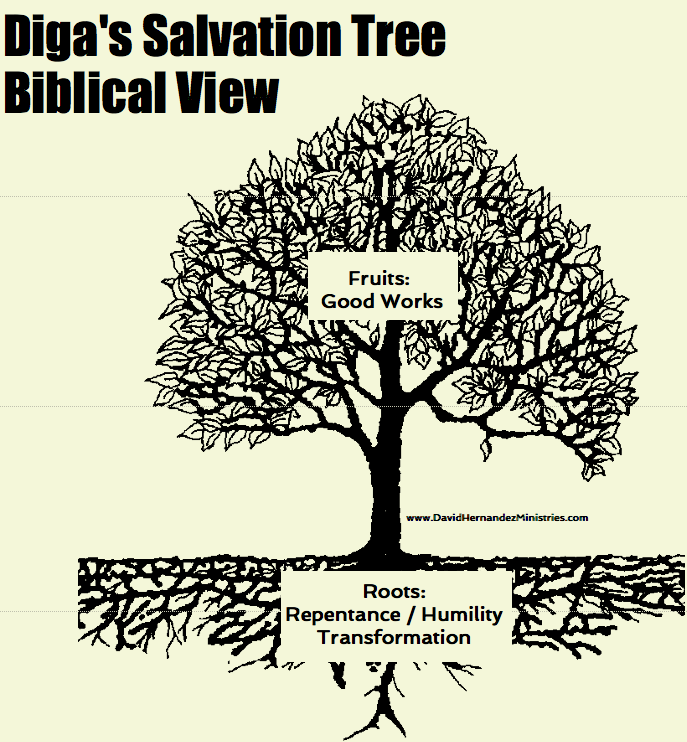 Good works are the fruits of salvation, not the roots. But if salvation is genuine, it will produce holiness. And that is what is being described in the book of James, true faith – true salvation. Holiness demonstrates the authenticity of our salvation, but it doesn’t produce it. Secondly, imagine that there is a long hallway with a door on each end. The first door, the one that leads into the hallway, is justification. Justification is instant. The moment you put your faith in Christ, God sees you as clean and justified. Your record is wiped clean. You are justified by faith. The long hallway is sanctification. Sanctification is the process by which you become more and more like Christ. Justification changes your legal standing before God, but Sanctification transforms you to become one who matches your new legal standing. No matter where you are in the hallway of sanctification, you can rest assured that you are already passed the door of justification. Where you are in your growth does not affect how you look to God. So then salvation is not a matter of being perfect but of being perfected. So long as you are in the hallway, you are saved, even if you make sinful mistakes. The door at the other end of the hallway is glorification. Glorification is when you look like Christ. By the way, the Holy Spirit is the one who laid out the welcome mat. So if you die while committing a sin, do you go to Heaven or Hell? Do people who commit suicide lose their salvation? Will God reject me if I think a sinful thought? The answer will vary based on whether or not someone is saved. Each person would experience a different eternal fate in those circumstances. It’s case by case. What is the common assumption behind the questions? The assumption is that salvation is produced by good works. But even those who are saved will experience moments of failure. We must understand that salvation is a miraculous and supernatural work of God. And, yes, that supernatural work of God is evidenced by holiness. But our failures are not enough to break God’s grip on us. Now, if a man continues in a lifestyle of sin, eventually his roots will dry up and cause the tree to die. But if we maintain the roots with constant repentance, humility and pliability, God will continue to transform us and keep the tree of salvation healthy.